Hampton Rovers had their first official practice game of 2019 on the weekend, going down to SFNL division one team St Kilda City by 24 points. 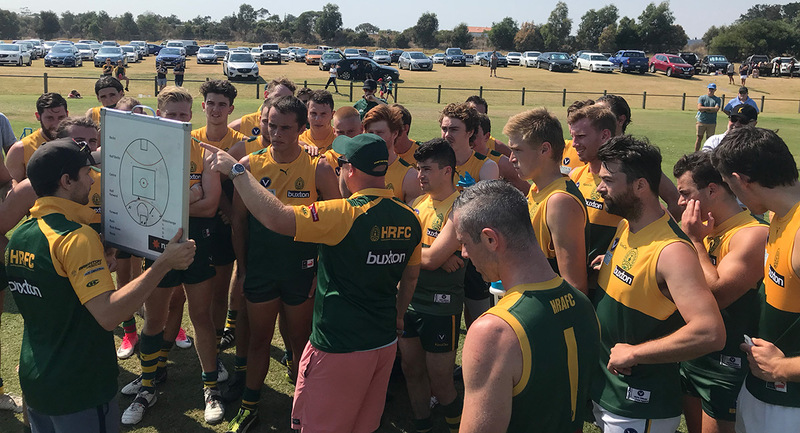 It was a solid hit-out for the Rovers against strong opposition in hot conditions at Tattersons Park Keysborough, with St Kilda making the finals last year and recruiting well over the off-season. Following a disappointing first quarter in which the Rovers turned over the footy more often than not, they held their own from that point on, kicking 6.10 to 6.5 in the remaining three terms. Great to see livewire Sam Bradford back in Rovers colours in 2019 and he made an impact, kicking four goals, while Hodges, Rieniets and Folino kicked one each. Cam Hetherington and Oscar Roberts had a presence around the ground while Josh Broadley battled hard in the ruck all day, backed up by Charlie Miles. Leigh Fletcher was also spotted in the green & gold and did what Fletch does best with a few trademark fend-offs and thrusts forward – could we see him back in action during the season? A good first-up run for the boys and plenty of positives to take from the game. Strong performance after a slow start, with some good signs ahead of the 2019 season. Looking forward to seeing the likes of Carnovale, Corp, Pinto among others return in the coming weeks. The combined Reserves/U19s side ran out 26-point winners over St Kilda City in the early game. Plenty of positives to take from the game and good to see the return of Jesse Lovig after a stint overseas.